Let's create a new page with dimensions of 13"x19", figuring that that we will be large enough to contain all our flowers. Just for the heck of it, I have put them on cyan again. On the right, we have extracts 1-5 in pink. On the left, we have our lavender bloosoms. As it turned out, we just barley have enough room to fit them all. I have also created a couple of "lines" of linked blossoms on a smaller scale. We will come to the how and why of that later. Each flower will show up on its own layer and you can label each as you wish. We could, of course, combine these flowers with other kinds of flowers, portraits, figures, geometric designs, animals and all kinds of other images to create an infinity of designs. You could take one or two flowers and put them into a woman's hair for a portrait. Use your imagination. 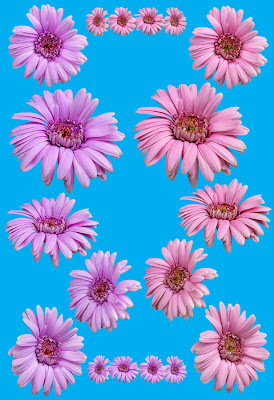 Using this page, I will create flower compositions with various combinations of blooms with or without foliage for prints, posters or cards; borders/frames, bookmarks all with or without added text. I can also go to Zazzle or Cafe Press and make the designs into t shirts, mugs, buttons, ties, postage stamps and more. In this tutorial, we are going to create a flower mandala. In it, you will learn all the skills you would need to create the other forms.